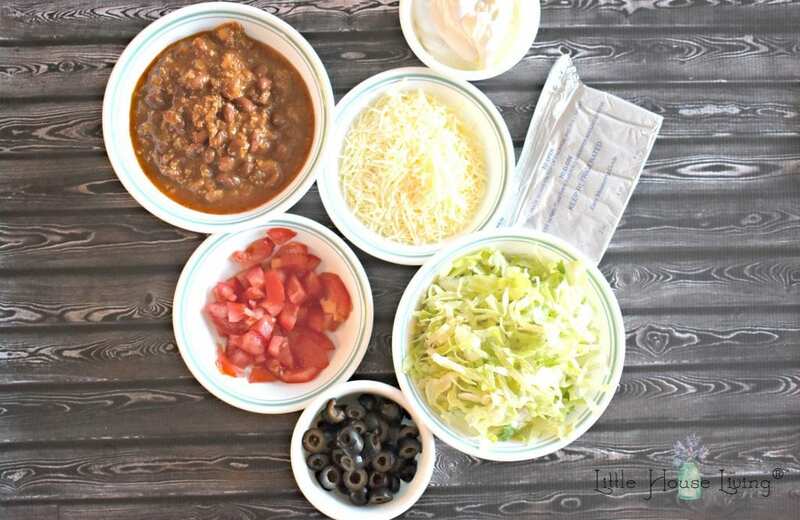 7 Layer Taco Dip is a delicious appetizer, potluck food, or even a whole meal in its own. Great for any time of year and perfect for the whole family! 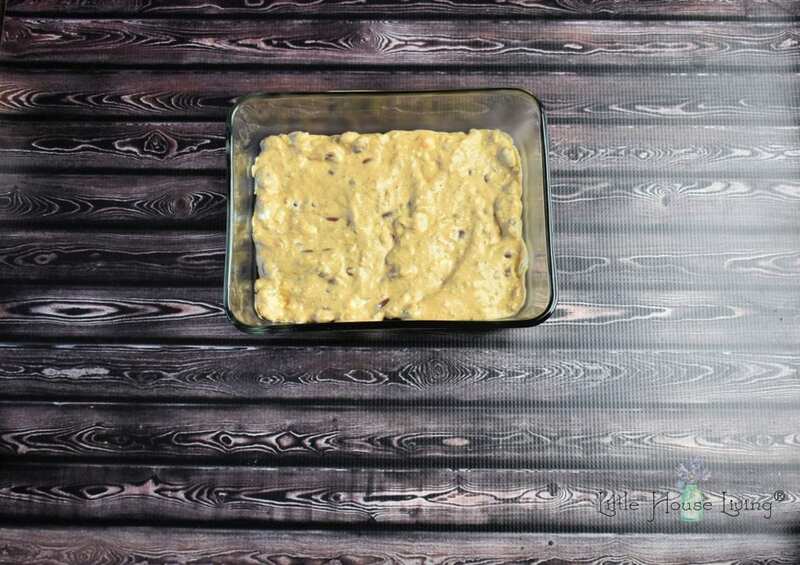 Need the perfect appetizer for your next get-together that you know everyone will enjoy? 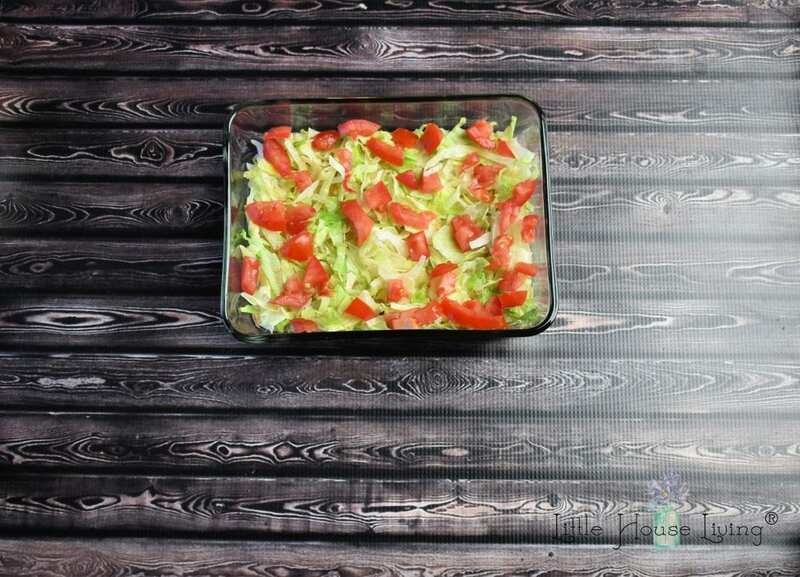 This 7 Layer Taco Dip is so easy to put together but it has excellent flavor and is something that most people will enjoy. 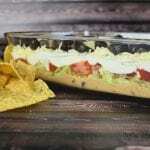 The genius part of this recipe is that 7 layer taco dip is extremely easy to make and only takes about 15 minutes hands on! We’ve always found this to be a party favorite, although it makes a simple meal at home too. 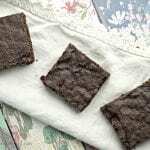 If you enjoy simple recipes like this you might also enjoy Merissa’s book, Little House Living: The Make Your Own Guide to a Frugal, Simple, Self Sufficient Life. It’s filled with over 130 from-scratch recipes that are easy to make! In a small bowl or saucepan, heat the cream cheese and chili until you are able to mix it together without leaving lumps of the cream cheese. 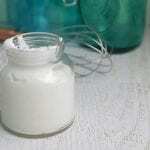 Add this mixture as the first/second combined layer on the bottom of your dish. Smooth it out to form an even layer. 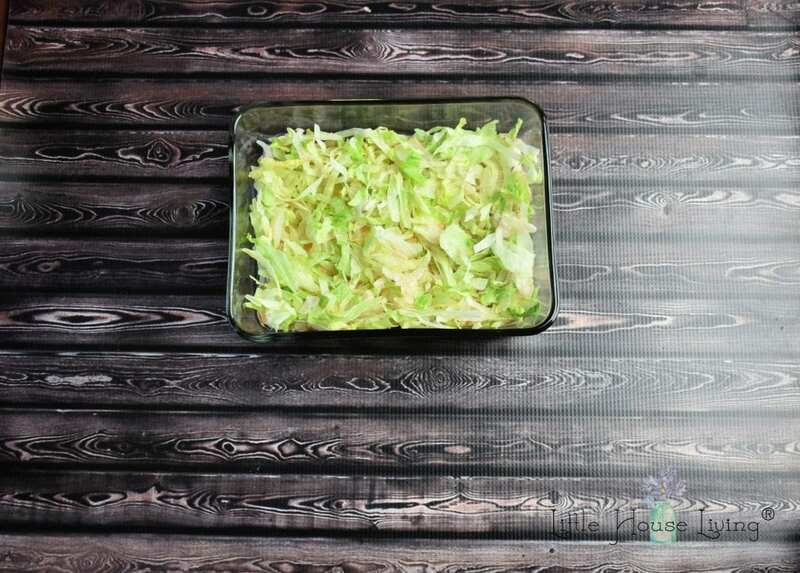 Add the layer of shredded lettuce. Add the layer of diced tomatoes. Smooth the sour cream over the tomatoes. The easiest way to do this is to drop small dollops of sour cream over your dish and carefully spread them so that they are in a semi-even layer. Sprinkle the cheese over the top. 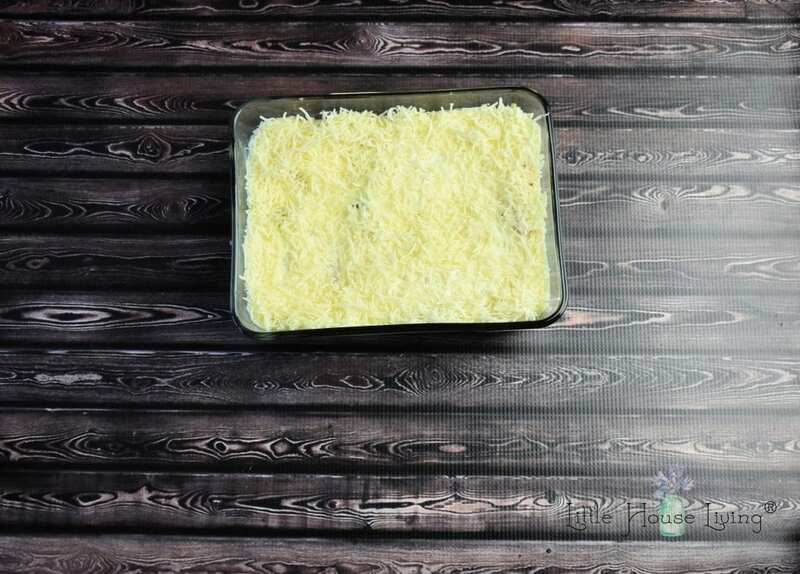 I used a white cheddar cheese on my 7 Layer Taco Dip but you can use any shredded cheese you have on hand. A nice sharp cheese works well but a pepper jack is also fun! Finally, add the sliced olives to the top. Add a spicy chili or refried bean to give it a kick. Use a different kind of cheese, such as pepper jack. Add a layer of guacamole. Add a layer of salsa. Add shredded chicken to make it more of a meal. 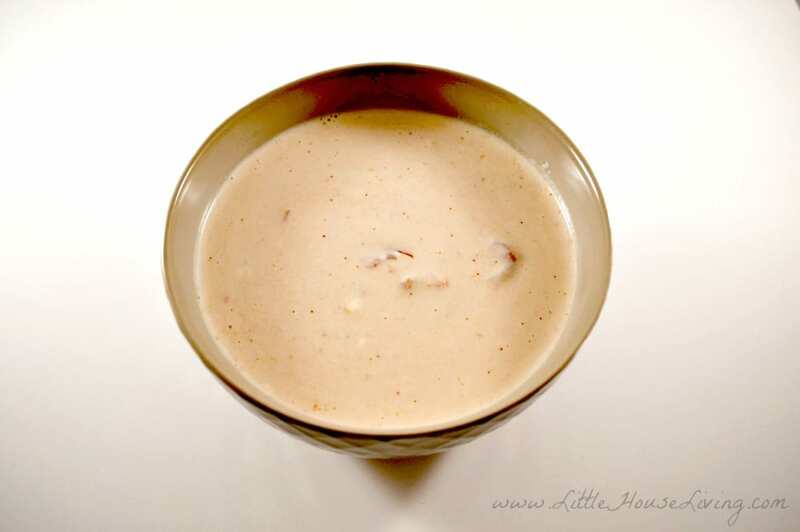 In a small bowl, combine the chili and cream cheese and heat until they can be mixed together. Spread in an 8x8 baking dish for the first layer. Add the sour cream in a layer. Serve anytime with your favorite tortilla chips. 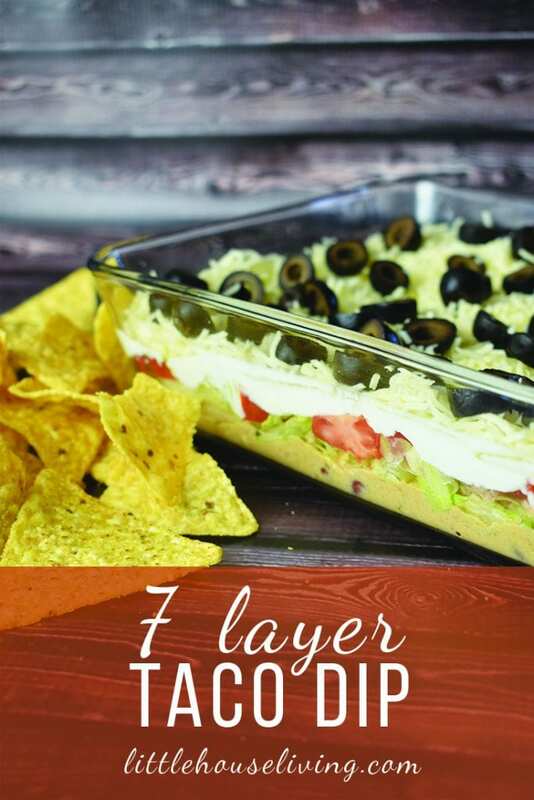 Have you ever made 7 Layer Taco Dip before? Ok, you had me at Taco Dip! I printed this out and will definitely be making it at the next gathering. Growing up in the midwest, this dish was a staple at carry-in dinners. I love it. Thanks so much for sharing your recipe. We will just love your 7 layer taco dip, it won’t last long here. Thank you so much for sharing with Full Plate Thursday and have a fabulous weekend. This looks so good… that first picture is simply gorgeous!! Thanks for sharing with us at Monday Funday! This looks amazing! It would be great for all of those summer parties! I host a really fun party on Wednesday’s and I would love for you to come by and share this with my friends. 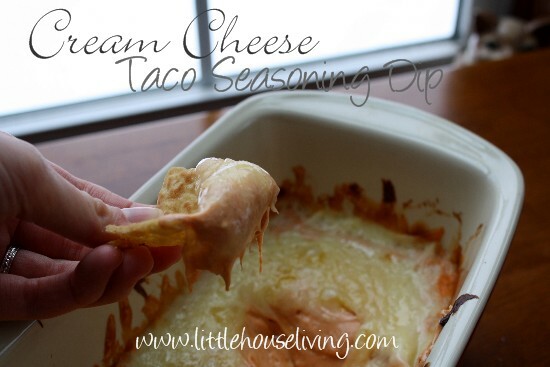 Best party dip evah! Thanks for linking up with What’s Cookin’ Wednesday! 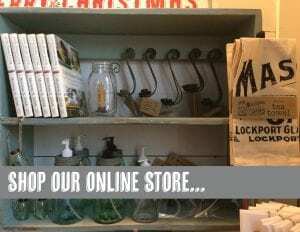 Congratulations on being featured on the What’s Cookin’ blog hop. When I saw the photo of this dip, I had to stop by. It is a lovely site to behold. My family loves dips like this. We’re more likely, though, to scoop it into a bowl and eat it all up! LOL. Great recipe! Sometimes I make my taco dip with a homemade roasted red pepper hummus on the bottom(no cream cheese,chili, taco seasoning) with the lettuce, tomato(leave off cheese for vegan friends), other toppings, etc. 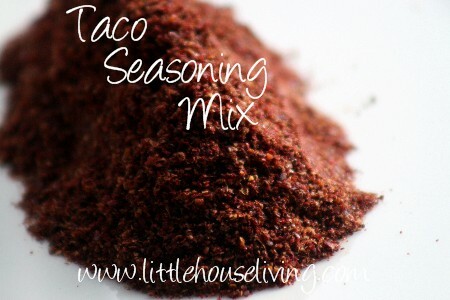 For a super healthy layer taco dip. It’s awesome and you don’t so much miss that other stuff. Does this have to be served warm? Or is it ok cold? I am wanting to take it to a party and need to make it about an hour ahead of time. Thanks! I usually serve this cold, it could go either way. Can I make this the night before? Wanting to take it to a work party! Yes, it should be just fine making it the night before. I’ve madr thisnusing mynown chili, and it was delicious! 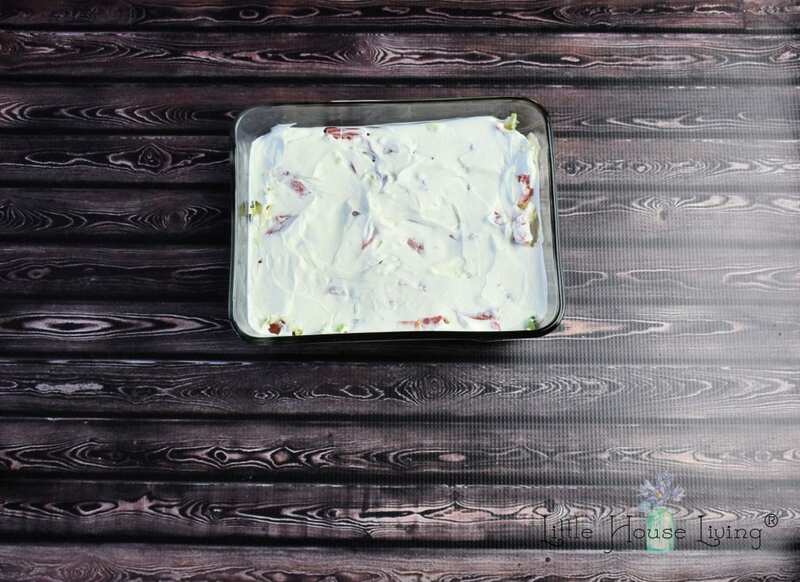 A great tip for the spir cream topping is to put it into a plastic bag and cut the tip off–the pipe the sour cream over the dish in whatever pattern suits you. It makes it much easier and let’s the whole dish look professional! I’d love for you to share with us at our Friday Favorites party! 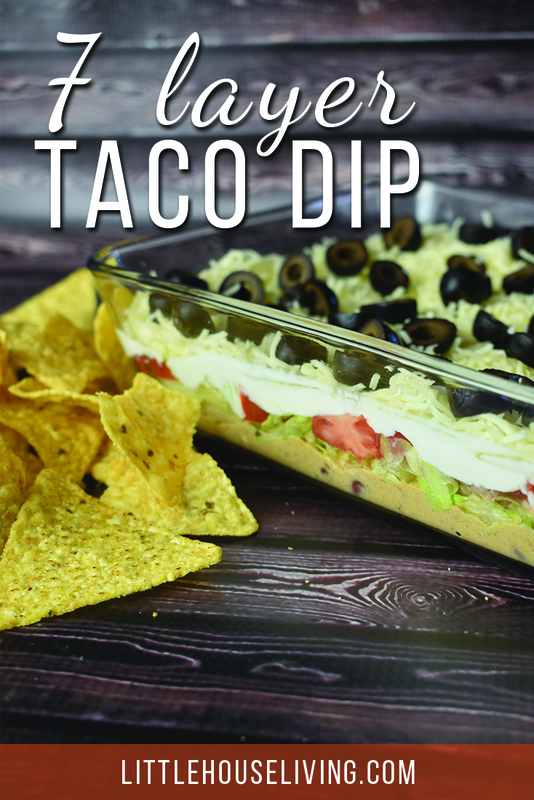 I love taco dips, they are always such big hits at parties, your version sounds delicious! I have definitely made similar versions before. Thanks for sharing at What’d You Do This Weekend?! What size dish are you using? This looks so good. 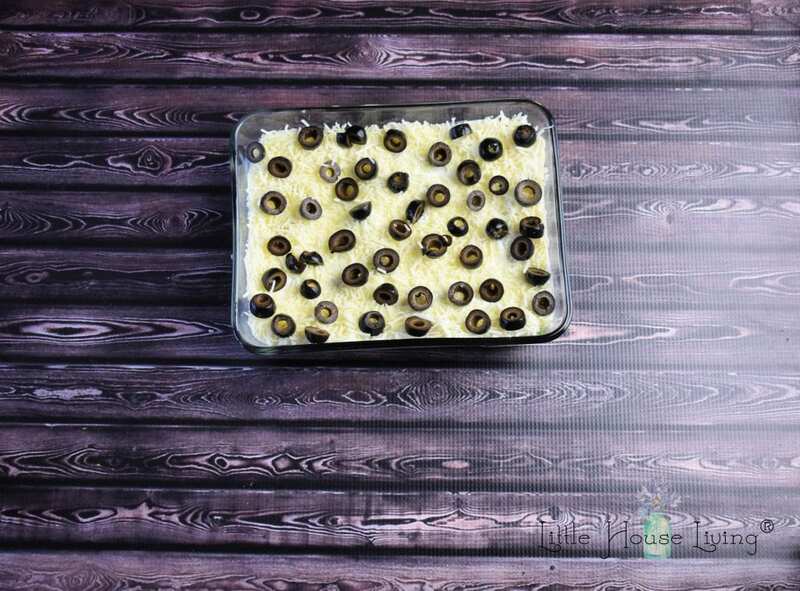 I love black olives the most! Just perfect for the upcoming superbowl. Thanks for sharing. #SmallVictoriesLinkUP. 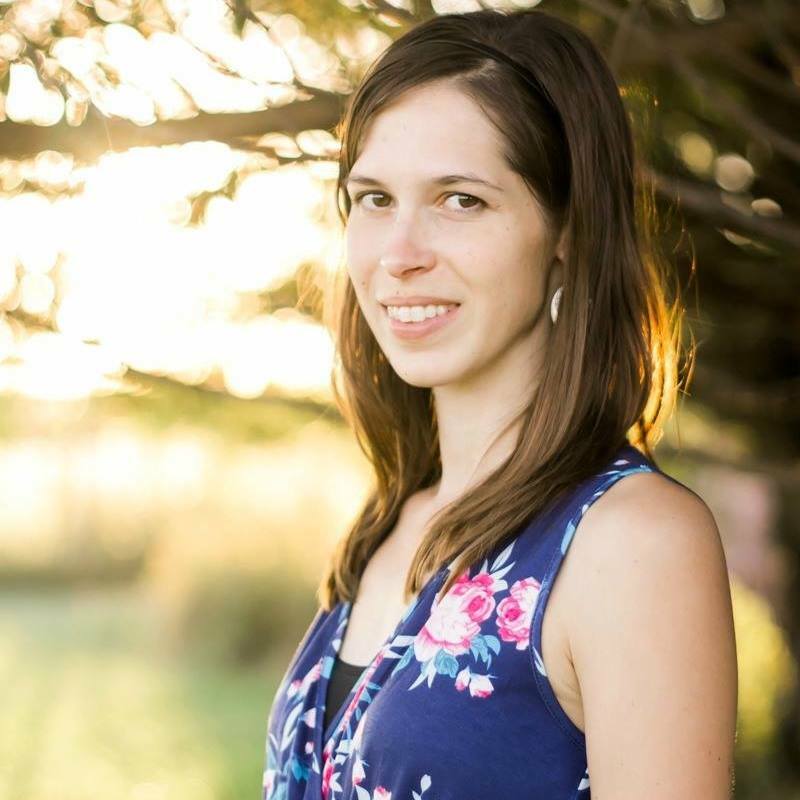 I made your recipe my featured blogger for SmallVictories this week in my latest post. It went really well with the hot sausage dip I posted. Yum! I make a similar dip with refried beans (mixed with taco seasoning), sour cream, cheese, tomatoes, black olives, and green onions. It’s only 6 layers but 7 ingredients :). Do you mind if I share this on my blog on Monday? Can I use a photo? Thanks! Hi Kristan, thanks for asking! Here’s a link to our Sharing Guidelines. LOVE taco dip! This sounds like such a great, easy recipe, and I can’t wait to try it (this weekend, for sure). Visiting from Think Tank Thursday blog hop. Thanks so much for sharing with us at Full Plate Thursday and have a fabulous 4th! 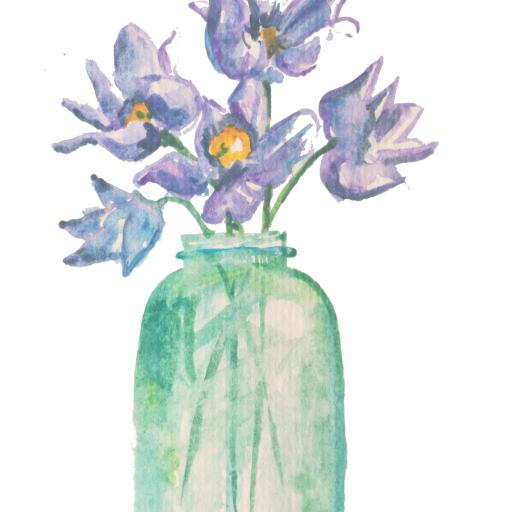 Visiting from Inspiration Monday linkup. Pinned for later! Btw I like the cute little eggs in your header. We got our first chickens this year. One just crowed his first little cracking rooster voice yesterday. But still waiting on the little prizes they are supposed to deliver. That looks delicious! Thanks for sharing at Merry Mondays!! This looks delicious. Pinned, my family will love this. I love delicious dips for chips. Can just eat and eat them! I will definitely have to bring this to my next party, easy and looks delicious! I tried to bring a dip like this to a gathering last week, but l forgot it in the fridge! Incorporating chili is a great idea. My family has always made a version of this. It is my go to dish to take to parties. 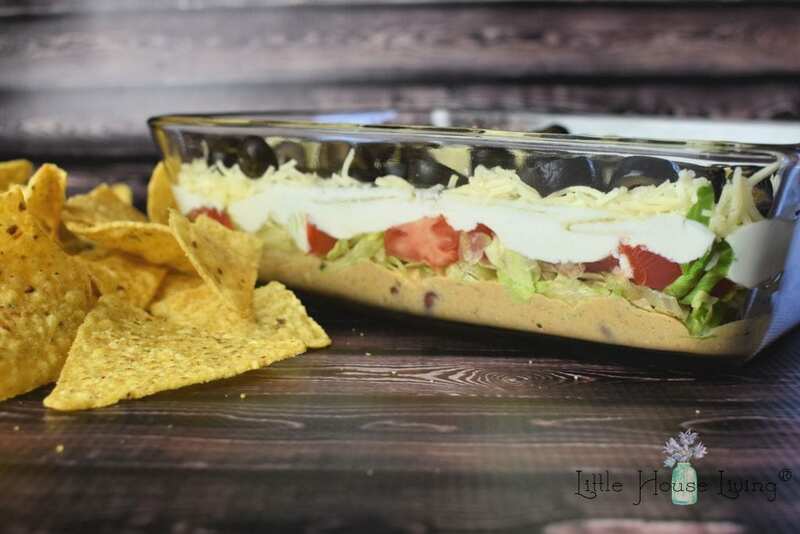 I’ve always loved 7 layer dip, but this one is a little different than the one that I am used to making so I am going to give this one a try. Thank you for sharing at Tasty Tuesdays link party. 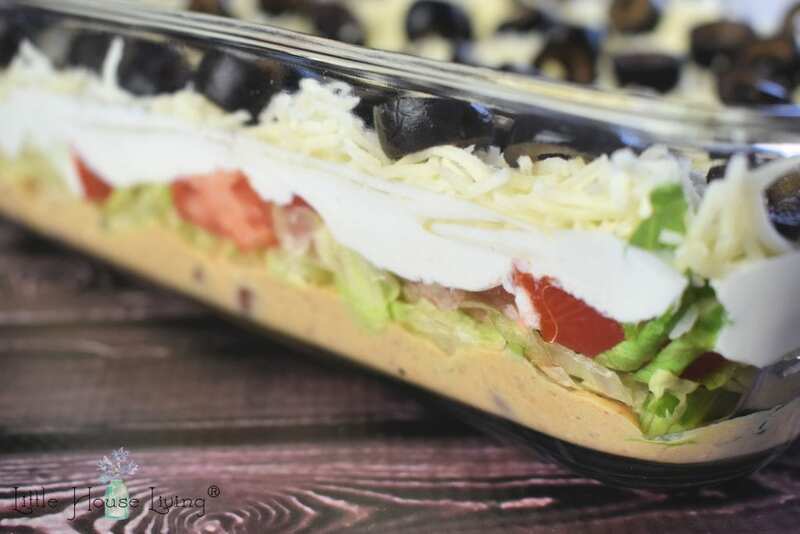 We always enjoy this classic 7 layer dip! So glad you could join us on Full Plate Thursday and thanks so much for sharing with us. Hope you have a great week and a very Happy Mothers Day! This looks delish!! Mexican is one of my favorites!